The Wilson Staff Nexus cart bag features four fibre reinforced plastic connectors that allow weight to be removed from the structure of the bag. On the top of the bag, a technology called S-Lock “locks in” single clubs near the hosel to prevent rattling on the cart or trolley. 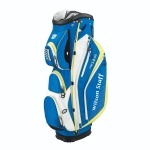 Call us on (06) 364 6468 to get the best NZ price on the Wilson Staff Nexus Cart Bag. The Sun Mountain H2NO Cart Lite Bag is constructed with waterproof fabrics, high-quality YKK zippers and sealed seams. The bag is waterproof, when the rain-hood is used as designed, in conjunction with the bag. It features a new top which is flared for easy club retrieval and an Auto-Fit™ Dual Strap System makes it easy to adjust and to get on and off. The bag contains five pockets, including a velour-lined valuables pocket, and a full-length clothing pocket. It also has a cart-friendly bottom and leg-lock system. The Sun Mountain Sync Cart Bag was designed for use on push carts. Sun Mountain started with a top and bottom designed to nest in the upper and lower bag wraps of Sun Mountain push carts. They then molded the bottom so it fits over the lower bag rest of the Speed Cart and Micro-Cart Series carts, minimizing side-to-side movement. A new, 15-way top with individual full-length dividers offers maximum club protection. The custom-molded bottom fits over the lower bag rest of the Speed Cart and Micro-Cart series carts, minimizing side-to-side movement. All pockets are forward facing and accessible when the bag is on a cart. There are nine pockets including two full-length clothing pockets, a velour-lined valuables pocket and a beverage pocket. Call us on (06) 364 6468 to get the best NZ price on the Sun Mountain Sync Cart Bag. The StaDry™ Cart Bag is designed to work seamlessly with cart use and allows players to be free of distraction from inclement weather knowing that their Golf Gear is protected. 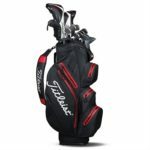 The StaDry™ waterproof Cart Bag is ideal for the dedicated golfer who plays in all conditions. Call us on (06) 364 6468 to get the best NZ price on the Titleist Stadry Cart.